From the Boston Lyric Opera, photo credit Marina Levitskaya. Rigoletto is the story of the lascivious Duke of Mantua (Scott Quinn) and his life that knows no bounds. The hunchbacked jester Rigoletto (Todd Thomas) in a similar manner, spares no expense to entertain. In one particular situation, the Duke seduces a courtier’s daughter and becomes a mockery by-way of Rigoletto’s constant scoffing. It ends up, that courtier curses both the Duke and Rigoletto, which in turn involves his lovely daughter Gilda (Nadine Sierra). Word gets around town that “the hunchback” has a mistress and the Duke’s men go to investigate (but they’re actually misidentifying Gilda, and from there the curse begins). Gilda gets kidnapped and brought back to the Duke. 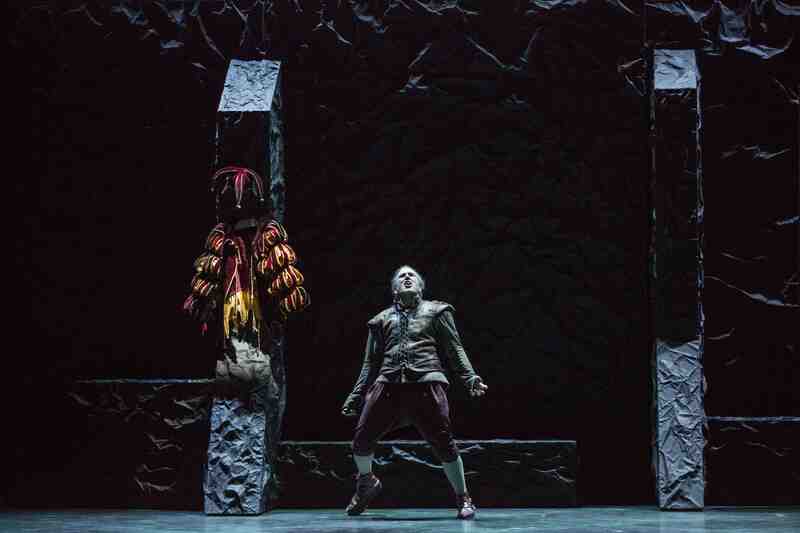 Rigoletto cries his way into the hearts of the masses and finally gets his daughter back. Refusing to “let it go” he hires an assassin named Sparafucile (Morris Robinson) to kill the Duke and exact his revenge. A series of twists and turns happen between his meeting with Sparafucile and when he’s brought the body, only for the jester to find the slain body of his beloved daughter. This production was a three-tier effort by Opera Omaha, Boston Lyric Opera, and The Atlanta Opera. The set was beautiful and the costumes were stunning. This was the Atlanta Opera debut of performers Todd Thomas (Rigoletto), Nadine Sierra (Gilda), Scott Quinn (Duke of Mantua), and Krysty Swann (Maddalena). A feature you don’t see too often was that of subtitles. A small screen could be seen above the stage that would show choice lines and song lyrics. Since the story is in Italian, this played a great help to those who aren’t familiar with the story and in general to grasp a better understanding. Another factor that made the performance so breathtaking was the music from the Atlanta Opera Orchestra. Their sound greatly complimented the arias by the performers. While listening to the soothing sounds of the chorus and principles, you could hear notable pieces such as “La Donna e Mobile” and “Caro Nome.” Now although you may not be familiar with them by name, I’m most confident you’ll recognize “La Donna e Mobile” immediately if you’ve ever watched Bugs Bunny in Looney Tunes. Its also been played in a myriad of commercials. You can hear it below by Pavarotti and I’m most certain you’ll be familiar with it. Be sure to check the Atlanta Opera website to stay on track of the rest of the performances this season and get a head start on 2015/16.